The following are excerpts from the testimonials by participants of Executive W.H.I.T.E. Leadership™ Engagement. Good eye-opener to realize one’s underdeveloped strengths. A good session to instill awareness on how to consciously think of one’s actions, and how we can turn all the negatives into positives. I think the programme was very “in your face” in its approach. It really opens up your eyes to see or should I say, “think about”, some areas of improvement/realignment in terms of how to effectively lead. The 2 days’ course was an eye-opener for me. 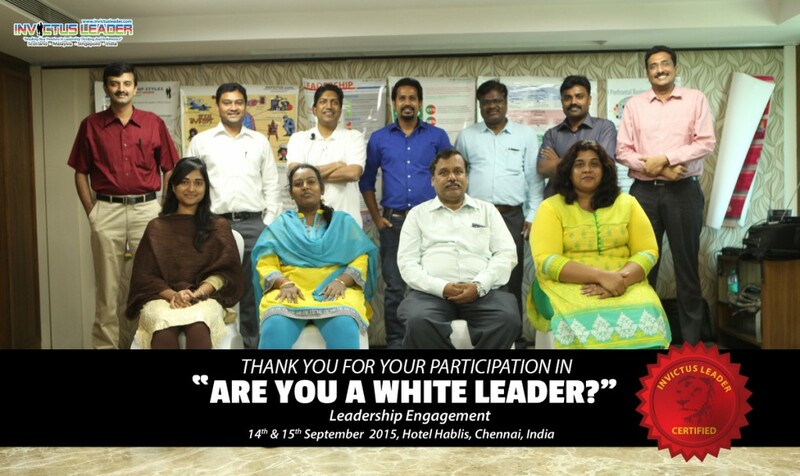 Now I’m able to understand what White Leadership is about, and also how to assess oneself – where I am going to. I was able to understand because Mr Ravi’s presentation, engagement, explanation, interaction and feedback were superb. He is able to convince me that Executive W.H.I.T.E. Leadership engagement is practical and possible to be used. A step above mainstream programmes as it encourages thinking and reflection, and it focuses on ourselves. The facilitator is very articulate and has content. He emphasizes key concepts well. Interesting and enriching. Provides us with the ability to see beyond conventional leadership training. Executive W.H.I.T.E. Leadership engagement can provide new perspectives in leadership; involves thinking challenges. An interesting, non-boring session. The facilitator has the ability to balance theory and practical well in the delivery of the subject matter. Ravi facilitates well; he’s the subject matter expert in this topic and is able to share his valuable experiences with the audience. This is something new and different to me. It’s more focused on self-reflection and the awareness of who I am and where I am now. Good exposure and an excellent experience. It is a good programme to help us rethink the way we behave, how we think and our way of life. I believe I can be more open when talking and engaging with others, and grow my team to be a better one. The facilitator has good experience in the topic, and he explains well to ensure that we understand the concept and knowledge. Executive W.H.I.T.E. Leadership engagement is a very wonderful concept of management, and I hope it could also apply to our local context or organizations. The facilitator is very knowledgeable. Filled with mind-boggling, creative, awakening experiences. The facilitator was bold, confident and honest. I find the 2-day programme enlightening as quite a number of tools were provided to participants to ensure that they were guided to gain understanding about the capabilities of a leader. I definitely wish to go further in this course/related future course. The facilitator is well-experienced. His assessment of people, in particular me, was almost accurate on the first day. A very useful and applicable insight into Executive W.H.I.T.E. Leadership that I can apply in my daily life. The facilitator is very knowledgeable about the subject and gave us very practical assessments. Excellent! The facilitator has good communication skills and is very knowledgeable. It enabled me to engage myself with a stronger realization of what I am capable of, who I am, where I am, when would my target deadline be in achieving what I want to achieve in order to be a leader, and how I am to do it. The facilitator is knowledgeable, engaging, “extensive” and pretty impressive. An eye-opener for those seeking knowledge about leadership. Would rate it 9/10. Overall, the facilitator is knowledgeable about the subject and he is entertaining. The facilitator is knowledgeable, filled with content, friendly and straightforward; he wants us to be successful. Executive W.H.I.T.E. Leadership engagement provides useful skills to help us analyze decision making and creativity. The facilitator is a knowledgeable, experienced trainer, and he is able to channel the message across easily although some parts may not be easy to understand initially. Those assessments were great! They helped me know myself better. I now have a totally different way of understanding leadership. This is probably the only training that I did not fall asleep…well done! Overall it was really good in getting us into thinking mode. The mind is opened up, and I believe it is a good start to being a great leader and how to make the difference in work and personal life. Ravi is good in shaking up a person’s thinking process. His experiences are great; his skills are proven. The facilitator is very experienced and was able to deliver the message effectively. This is more than a leadership course. It teaches us to survive in this ever-changing world by thinking more often in the coup d’oeil way. It also teaches us to be a good person. Ravi is very knowledgeable and a good speaker. Informative session and different in terms of input provided from previous leadership training attended. Wish that more time could be allocated for the whole picture to be fully understood. Opens up the mind on “thinking”. The facilitator has wide experience and is very knowledgeable. We learnt to think differently. I understood how not to be carried away by “mind hijack” and old thinking; gained effective understanding about leadership as a role. The programme was facilitated well; the facilitator has lots of experience in the field. It is really a very useful engagement, which is eye-opening for me, regarding the importance of the thinking process in leadership activities. The facilitator has very good presentation skills, knowledge, experience and command on the topics covered. Good eye-opener on leadership thinking. Links change in thinking process to leadership. The facilitator is impressive. He has lots of practical examples to substantiate the theory. This programme changed my perception about leadership. It’s all about THINKING. Learnt more about the different parts/functions of brain and how important it is to train our brain. Also learnt/understood the importance of reading. Overall I would say that the workshop is an eye-opener on leadership. Sharing real time experience is really good. Mr Ravi’s facilitation skills are excellent. Executive W.H.I.T.E. 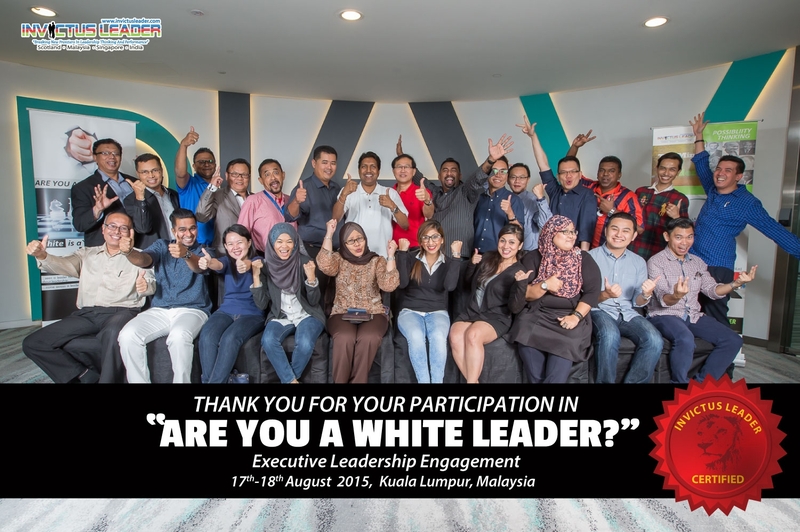 Leadership engagement is quite different from what I have come across so far in the field. It is good in terms of triggering our thinking capacity. The facilitator is really good in his skills, knowledge and experience. I am personally thrilled by the way in which he shares the best examples and best practices found around the world.